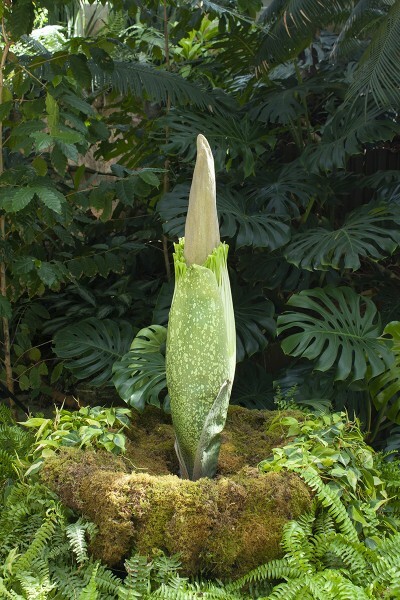 Frederik Meijer Gardens & Sculpture Park is excited to announce the bloom of a rare Amorphophallus titanum, commonly known as a corpse flower. Lovingly named “Putricia” by the Meijer Gardens horticulture staff, peak bloom is expected between Thursday, July 12 and Saturday, July 14, 2018 inside the Lena Meijer Tropical Conservatory. Guests can experience the sights and smells of this rare event during Meijer Gardens’ normal hours of operation. The corpse flower (Amorphophallus titanum) – also called titan arum – is one of the largest and rarest flowering plants in the world. It can take up to a decade to produce a flowering structure and when it blooms is open for only 24 to 36 hours. The name corpse flower comes from the nauseating smell that the plant emits when it opens. This feature attracts carrion beetles and flies that are the natural pollinators of Amorphophallus titanum. The plant was first reported in Sumatra, Indonesia, in 1878. Its distinctive odor attracts pollinators that feed on dead animals and is at its most pungent during peak bloom. Amorphophallus titanum is the largest unbranched inflorescence (a cluster of flowers on a spike) in the plant kingdom, growing up to 12 feet tall in its natural habitat and about six to eight feet tall in cultivation. 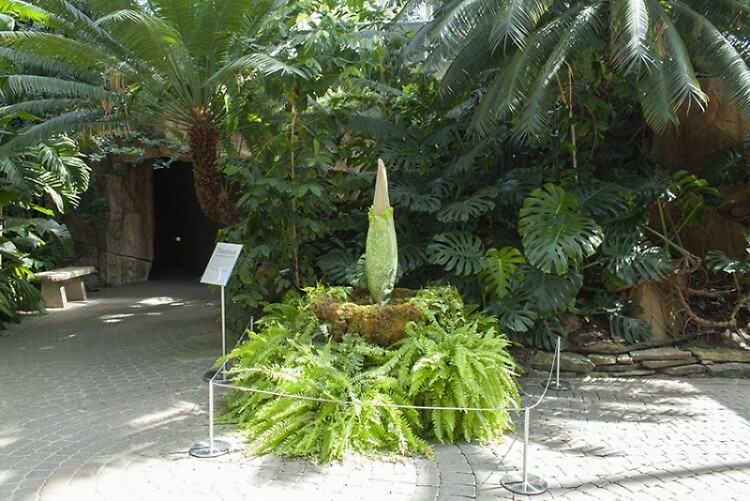 Although the enormous plant in bloom resembles one giant flower, it actually comprises a fleshy central spike called a spadix that holds two rings of male and female flowers, wrapped by the frilly spathe, a modified leaf that resembles a petal.